Its that time of year again, autumn. Leaves are falling, the sun feels different, the daylight hours match the night-time hours, and the kiddies are back to school. Its also the time when knitters feel compelled to pick up any UFOs (that’s knitter terminology for Un-Finished Objects) to give them another go-around or put new projects on the needles after a hiatus of summer heat. Knitting in summer is often an oxymoron for many knitters as why would one knit with wool/alpaca/mohair when its so hot out that the yarn is sweating? Some knitters find joy in knitting with cotton; I do not. So my knitting has suffered somewhat over the summer with not much else but getting that baby hat done for the Ravellenic Games. Until now. 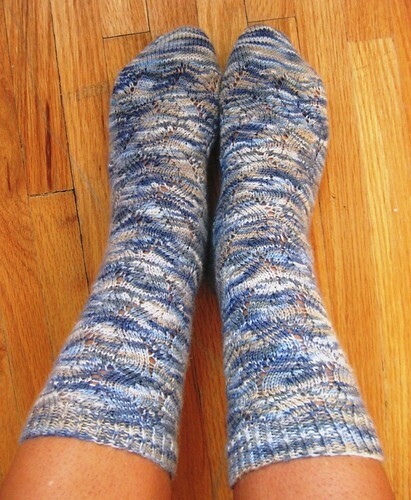 I’m very pleased to report that I finished up my “Fall Back” socks that I started this summer. 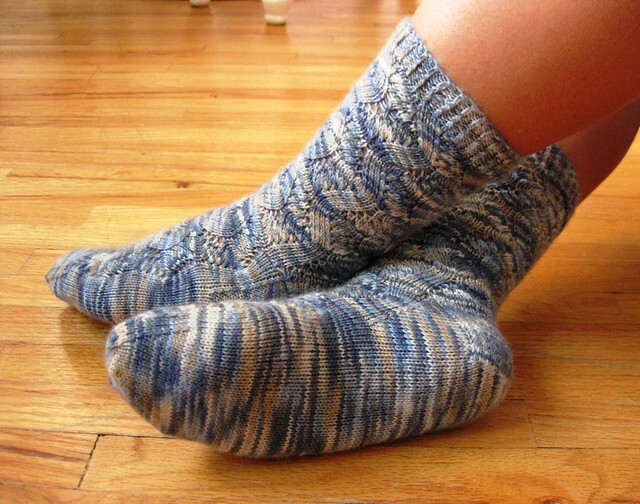 They were languishing on the dpns because I had some crankiness with the pattern. This was due to weird stitch counts on the needles at the gusset (and later, fudging the heck out of the toe decreases). Crankiness past, I was determined to move forward on this project. A big push was done this week when I fell ill to a plague (i.e. cold) that was going around my office at work. Luckily, being at home alone without TV meant that my socks got done quickly. And I managed to also spin yarn for almost two hours yesterday. Yay for getting crafts moving forward! yardage: 300.8 yards, and points for stashdown! You are currently reading Spring forward/Fall back… at When Gaia Smiles.